One of the most fundamental and sacred rights of any democracy is the right to vote; in order for our government to function effectively and respond to the needs of our people, all citizens can and must play a role in shaping it. It’s National Voter Registration Day 2016. As we head into a presidential election, finding out what you need to know about the election process, voting, and voter registration has never been easier. A great place to start? 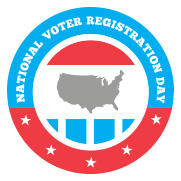 Visit the National Voter Registration Day website for voting information and resources, to register to vote or to update your registration, and to have a look at the social feed updated in real time for #CelebrateNVRD, and to find National Voter Registration Day events in your area. Learn about the Election Process, including the electoral college, caucuses and primaries. Want to better understand the historical and present composition of the American Electorate (voting rates, voter characteristics, voting methods, etc.)? Read Who Votes? Congressional Elections and the American Electorate: 1978-2014 (great charts and graphs, too). At the state level, in Georgia, start with the official My Voter Page to check your voter registration status, key election dates, poll and early voting locations, sample ballots and more. Learn more about Georgia’s VoteSafe program, which provides for the confidentiality of residence addresses of certain registered voters who have been, or may be, subject to acts of family violence or stalking or currently reside in a family violence shelter. This entry was posted in Lost in the Stacks (Reference) and tagged National Voter Registraton Day, voter fraud, voter ID laws, voter registration. Bookmark the permalink.